If photography is something you’re passionate about – whether it’s a hobby or you’ve successfully turned it into a career – then it might be something worth protecting. There are a lot of options for specialist camera insurance on the market but is it worth it? At The Insurance Emporium, we think these points are worth considering when it comes to cover for your photographic equipment. 1. That equipment doesn’t come cheap! Perhaps you have got a DSLR, a couple of lenses, a flash gun and some other accessories. In which case, you’ll already know how costly camera equipment can be. So, it’s worth considering whether you can afford to replace your gear if something were to go wrong. If the answer is no then perhaps looking into camera insurance could help. Your talents behind the lens might earn you a decent portion of your income. If so, then camera insurance could help to keep your business running even when things go wrong. For example, your policy could include cover for replacement hire, which might cover the cost of borrowing a camera and equipment while yours is replaced. Some people may feel that home or travel insurance is best for covering their camera equipment. 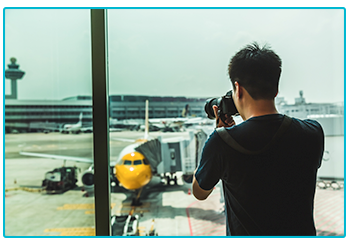 These might be the preferred options for people who mostly keep their photography gear at home or who take it abroad purely for recreational purposes. However, if you often use your photographic equipment in other scenarios – such as in a studio – then specialist insurance could be better suited. Specialist photographic equipment insurance tends to include a variety of benefits that are specifically of interest to photographers. 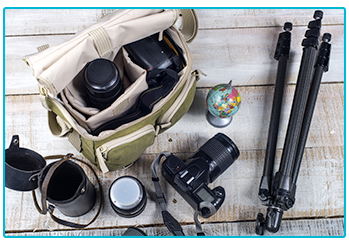 These could include cover for when your equipment is in an unattended vehicle, worldwide cover, public liability in relation to your photography activities and data recovery – all of which are offered by The Insurance Emporium. 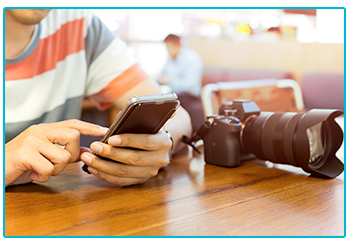 As well as protecting your designated camera equipment, you could also choose to get a variety of portable devices that you use as part of your photography passion, including your mobile phone, covered on your camera insurance. For example, The Insurance Emporium offers Gadgets and Mobile Phones cover as an Elective Benefit. This might be handy if any of the devices covered are lost, stolen or accidentally damaged. Many different types of photographers could find camera insurance useful – from those with an expensive hobby to those who use a camera for a living. At The Insurance Emporium, we offer Amateur & Semi-Professional Camera Insurance and Professional Camera Insurance for both needs. What’s more, new customers can take advantage of a 25% Introductory Discount*. Why not snap up a quote from The Insurance Emporium today? *The 25% Introductory Discount is available on lunar and calendar monthly policies and policies where the premium is paid annually. The Introductory Discount is available for the first 12 premium payments on lunar and calendar monthly policies or one premium payment on annual policies.